Thomas and I fed Havana for the first time (since we got her) this past Friday. 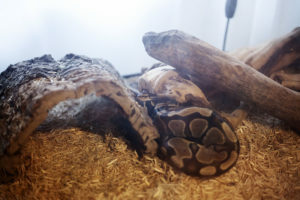 Three-year-old ball pythons are supposed to be eating large-sized rats, but I have a feeling her previous owner was only feeding her medium-sized rats or even mice, which are not nutritious enough for a python of her age. When we gave her the large rat to eat on Friday, she had a lot of trouble swallowing it, and she’s a little underweight for a snake, which is why I think she was underfed. That’s alright, though. It just means we’ll have to fatten her up ourselves! Here’s how we fed her: we took the rat out of the freezer, put it in a plastic bag, and thawed it out in a salad bowl (note: I’m never using that bowl for anything else again!). To thaw the rat, we filled the salad bowl with very warm water, and dropped the rat-in-a-bag into the water. I sat around the bowl poking the rat-in-a-bag with chopsticks and dunking it under the water until it went from being hard and frozen, to soft and thawed. Then Thomas dumped out the water in the salad bowl and ran hot water over the rat-in-a bag. We then took the rat out of the bag, dried it off with a few pieces of paper-towel, and I carried it to Havana’s tank in the salad bowl. Havana had just woken up for the night an hour or two earlier (she’d woken up around 7 PM), and was resting outside her hide. 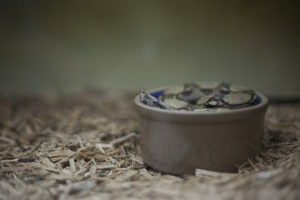 I opened her tank, picked up the rat with the chopsticks (which was really hard since the rat was so heavy) and dropped the rat near the entrance of Havana’s hide. 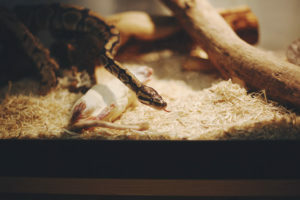 I was expecting to have to make the rat dance a little with my chopsticks to get Havana’s attention (usually snakes only like to eat live animals, so if you make the dead rats move when you feed them to your snake, the snake will usually dive for them, thinking they’re alive). Luckily, though, after a few seconds of having dropped the rat, Havana’s head turned abruptly in the direction of the rat. She paused for a moment, as if to make sure what she was smelling was food, then slithered over and quickly attacked the dead rat. Unfortunately, that wasn’t enough for her to eat the rat. Thomas and I turned off the lights in the room, watching Havana with the dim light from the hallway. We waited for 45 minutes, but Havana still wasn’t able to eat the dead rat (or get it much further than her mouth). She’d start to eat the rat from one side, give up, flip the rat around completely by dragging it, and try eating it from the other end. She did this about four times in 45 minutes. I told Thomas we should go, closing the door behind us, and come back in an hour and a half to see how she was doing then. She probably just needed some time to figure out how to eat the rat. We left, a bit worried about whether or not she could swallow it. Thomas insisted that he’d read many times that the rat was supposed to be slightly wider than the fattest portion of her body, and the large rat was, so it must be the right size for her. She had to be able to eat it, he said. I agreed with him, but I thought she’d probably never had a rat this big before, so she was probably going to need a lot of time to eat it, if she was even going to be able to get the rat down at all. We watched some TV to get our minds off of worrying about her, and waited for the hour and a half. When we walked back into the room, Havana had swallowed approximately half of the rat. We were both relieved. Thomas told me that once they got half their prey in, there would likely be no further problems. She just needed time to get the rest in. We came back after another half hour or so, and she’d finished eating and was lying down next to her hide. She looked happy, as far as I could tell. 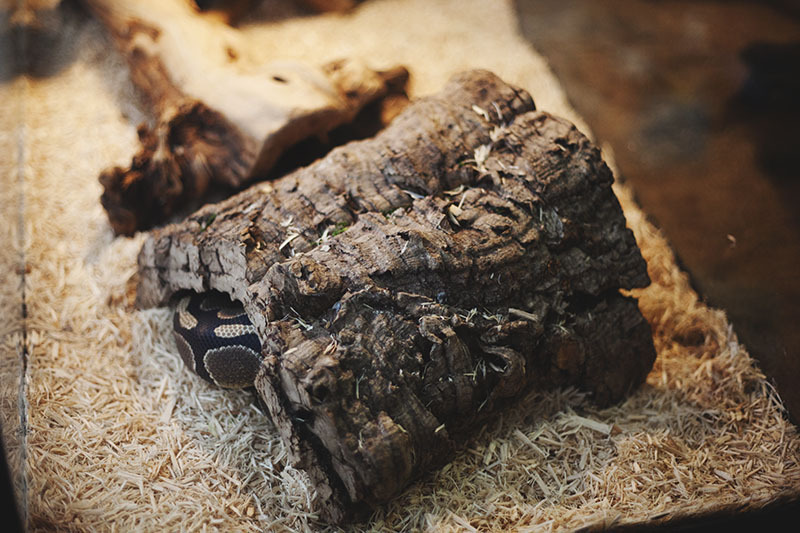 She rested by her hide like this for the entire weekend, not bothering to get in it once. Since most of her energy was being used to digest the rat, she didn’t bother to move much, even at night. This morning we woke up and she was in her hide again, sleeping some more. Needless to say, we don’t have any pictures of Havana feeding because we were too concerned with her swallowing the rat to be concerned with photographing the feeding. Also, since we left her in complete darkness while she tried eating, it would have been impossible to take pictures. 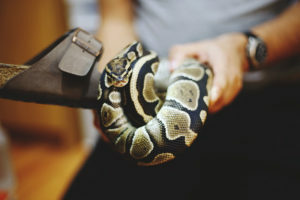 For those who have just gotten a python who is having trouble eating, I’d advise you to make sure the snake is in as much darkness as possible, to leave him or her alone for a while (which should lower stress), and to just give the snake plenty of time. The snake should be able to get the rat down at that point. 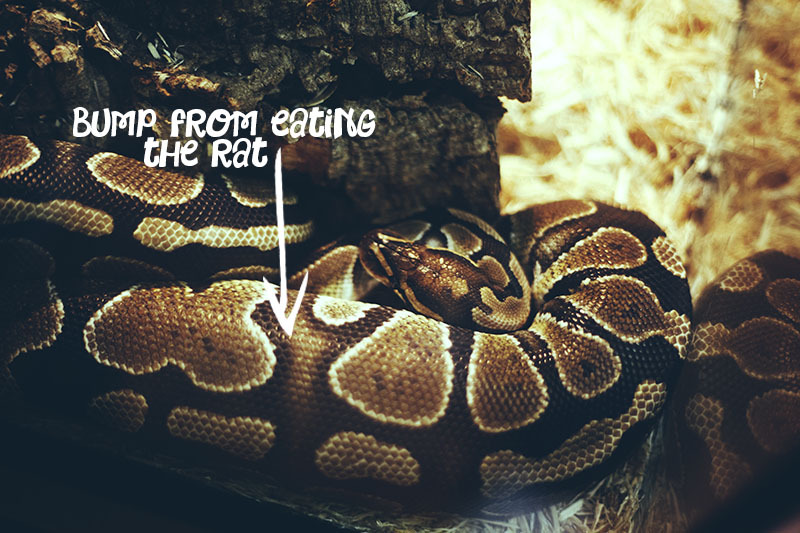 If he or she hasn’t, make sure the rat is warm enough, make the rat move, try a smaller rat, or try putting a bit of chicken broth on the rat (snakes love the smell of chicken). 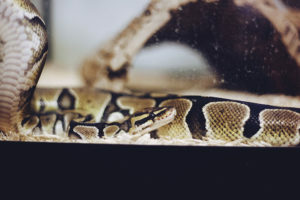 Snakes can live months, and sometimes up to a year, without food, so if your snake refuses to eat for a feeding or two, or even for a few months at a time, don’t worry; the snake will eat once it’s good and ready.